Stenciling - It's All Technique Baby!! If your here reading my post, then most likely you've found stenciling to be a challenge. I mean seriously, stenciling should be easy. After all, this is why we are stenciling and not hand lettering, am I right? I was not always a Master Stencilist! There was a time that I would rather tediously hand letter a project than pick up a stencil. The problem I had with stenciling was the bleeding under the stencil. I'm at my studio - hand lettering another sign, my friend and fellow crafter asks me "Why don't you use stencils?" Why indeed?! Because they bleed and look terrible! To this she replied... "Then your not doing it right" and proceeded to show me the correct way. It was a game changer! Talk about getting the secret recipe! I'm going to rock your world today and share with you my tips, tricks and technique in the world of stenciling!! Since that day- I have stenciled 100's of signs and teach classes full of men and women who stencil it perfectly the first time. The key to a beautiful stencil is TECHNIQUE. That's right, technique. It's not the stenciling material, the paint or the project- it is the technique. You do not need Mod Podge or to paint the color on first. That's just wasted time and energy. I use heavy weight card stock for all my stencils- 130 lb. I stencil with a makeup wedge sponge and I typically use craft paint or acrylic paint. However, I've used vinyl and mylar stencils, chalk paint and latex paint. Step 1: Grab your project and center your stencils- tape it down so that it's not going to slide when you are stenciling. You do not have to tape it down on all edges. In fact, I usually tape along the top so I can lift it up and see what my stenciling looks like. Step 2: Doesn't take much paint, about the size of nickle for a small stencil and maybe a quarter for a large stencil. You can always add more paint to the plate. Step 4: Now your ready to stencil on your board- with light pressure begin stenciling. You should see the color of the board through your stencil paint the first one to two times you pounce your sponge. Stenciling is more of a layering process to get the depth of color you want. If you have too much paint on your sponge the excess paint will bleed under your stencil. If you press too hard forcing paint out of your sponge, it will bleed under your stencil. Step 5: Immediately remove the stencil when you have finished your stencil. Don't leave it on to dry, it can cause your dried paint on the stencil material to pull up paint from your stenciled project. After you begin stenciling lift up your stencil, careful not to move it, to see if you are using the correct pressure and amount of paint. It is easier to correct bleeding at the beginning than to pull up your stencil at the end and realize you were pressing too hard or using too much paint. You may not need to layer as much paint as you think to get the depth of color- looking under the stencil will tell you if you need to do another layer of color. The smaller the font or the thinner the font the less paint you want to use. If you need to get into a thin line pounce off as much paint as you can from your sponge, this allows you to press a bit harder to get into a fine line. Note: if you press too hard- it will force paint under your stencil causing a bleed. 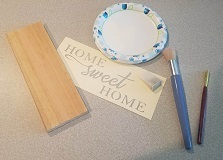 If stenciling wood signs- these boards are naturally rough even after sanding. Our natural tendency is to press harder to get paint in a crack or knot. If by gently pouncing you don't get paint into the crack or knot you can take a fine brush after you pull the stencil to apply paint. That's it- the entire process. It's super simple, but a technique that works 99% of the time with no bleeding. I'm sure your thinking... what about the 1%? That 1% can be on a very rough board or project and unless you use almost no paint on your sponge- it's going to bleed. I recommend more sanding to ensure it's rustic, but not out of the creek bed rustic. Go on now and try it... let me know in the comments if it truly rocked your stenciling world!! Interested in starting your own Wood Sign Party Business? Visit our Creative Wood Party Inner Circle, where we teach you everything you need to know about the Wood Sign Party Business.